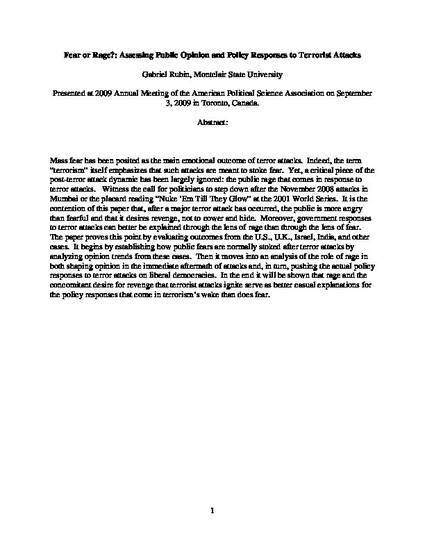 American Political Science Association 2009 Toronto Meeting Paper. Mass fear has been posited as the main emotional outcome of terror attacks. Indeed, the term “terrorism” itself emphasizes that such attacks are meant to stoke fear. Yet, a critical piece of the post-terror attack dynamic has been largely ignored: the public rage that comes in response to terror attacks. Witness the call for politicians to step down after the November 2008 attacks in Mumbai or the placard reading “Nuke ‘Em Till They Glow” at the 2001 World Series. It is the contention of this paper that, after a major terror attack has occurred, the public is more angry than fearful and that it desires revenge, not to cower and hide. Moreover, government responses to terror attacks can better be explained through the lens of rage than through the lens of fear. The paper proves this point by evaluating outcomes from the U.S., U.K., Israel, India, and other cases. It begins by establishing how public fears are normally stoked after terror attacks by analyzing opinion trends from these cases. Then it moves into an analysis of the role of rage in both shaping opinion in the immediate aftermath of attacks and, in turn, pushing the actual policy responses to terror attacks on liberal democracies. In the end it will be shown that rage and the concomitant desire for revenge that terrorist attacks ignite serve as better casual explanations for the policy responses that come in terrorism’s wake than does fear. Rubin, G. (2009, September). Fear or Rage? : Assessing Public Opinion and Policy Responses to Terrorist Attacks. In Assessing Public Opinion and Policy Responses to Terrorist Attacks (September 3, 2009). APSA 2009 Toronto Meeting Paper.